There aren't many times when I hear an album and don't immediately have an opinion on it’s level of "goodness." 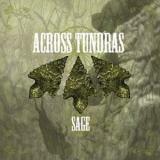 At this point in my metal listening career I have a solid idea of what I like to hear and what turns me off to an album, but Across Tundras have done some interesting and out of the ordinary things on Sage that makes surprisingly few demands of the listener, although it can feel strange simply because of the style of the music. At some times the sound seems aimless, at others very focused, but for the most part it stays quite listenable simply because of an undercurrent that keeps it consistent. By now I'm sure you have no idea what I'm rambling about so I will try to break down the sound of this album, which is a mixture of sludge, Western/country influenced metal, and occasional psychedelic influences. The first thing you'll notice is a big focus on the drums and bass, which are usually pretty down-tempo affairs that pound along with the slow pace of the songs and are backed with different styles of guitar. The next thing is the importance of the sound of the guitar, which mostly takes its cues from Southern rock and metal, and definitely some country/Western influences with occasional elements that are more psychedelic. The first track In The Name Of River Grand starts off with the pounding drums and slow, smooth bass, with the guitar whining a bit in the background. When the vocals of "TGO" do come in they are pretty standard for stoner metal. This is quite a long song at over 8 minutes, and it doesn't really strike me as particularly exciting, though it's pretty easy on the ears. The opening of Hijo de Desierto makes the Southern rock influences even more apparent, with the lyrics also focusing on deserts. Once again the vocalist has a pretty standard singing style that fits the music, but isn't terribly interesting. Buried Arrows comes in with a tribal-like sounds of big bass notes and rhythmic drums. The vocalist uses his smooth style anbd is backed up nicely by female vocals. This is a more upbeat song that is easy to listen to and keeps with the Western/desert theme of the album. Tchulu Junction definitely brings in some more sludge metal elements. For one thing the riffs get much heavier and become more of a central instrument at times. The vocalist also makes use of his raspier vocals, which fit this darker mood. The song plods along for its entire 8 and a half minute duration, and by the time it's other you'll feel like you've just attempted to cross a desert with no water. It's a song that deserves a solid listen. Shunka Sapa is similar with big drums and bass as usual to start out, but allowing the guitars and psychedelic elements to gain a firmer hold, which sometimes manages to remind me of a soundscape that the The Flaming Lips would come up with. This last track is instrumental and I think really shows the talents of the band when they try to convey a story or set a mood/theme with music. To really appreciate what this album has to offer, I think you really need to listen to it. Put it on while the sun is going down, sitting in a dusky room with a lit candle. You'll probably feel like you're on a journey through some forgotten desert. If you like music that you can just sit back and relax to without having to really listen to it, this is a good album. However, you can also really focus on it and not become bored too quickly. There are some really interesting things done here, and the instruments are played quite well. The lower end of the sound can get a bit overpowering at times, especially if listening to the album through headphones, but it’s not a major problem. For the most part I found this to be an interesting take on the stoner/sludge sound and those who enjoy bands like Weedeater and Rwake, but can do without the in-your-face heaviness, should give these guys a chance.